The history of Echternach Basilica has been unusually long and perplexed. This church has existed here for more than 1300 years, it has been multiple times demolished and then rebuilt again. The history of Echternach starts in the times of Ancient Rome. In these times, around 60 AD here was built one of the largest Roman palaces north from the Alps. This lavish palace existed until the 5th century. By the 6th century here, at the Sauer River by the see of Trier was built a Christian monastery with a small church. In 698 AD here came Willibrord – influential missionary. This outstanding, educated man was coming from Northumbria (England) and was sent to Frisia to Christianize local people. 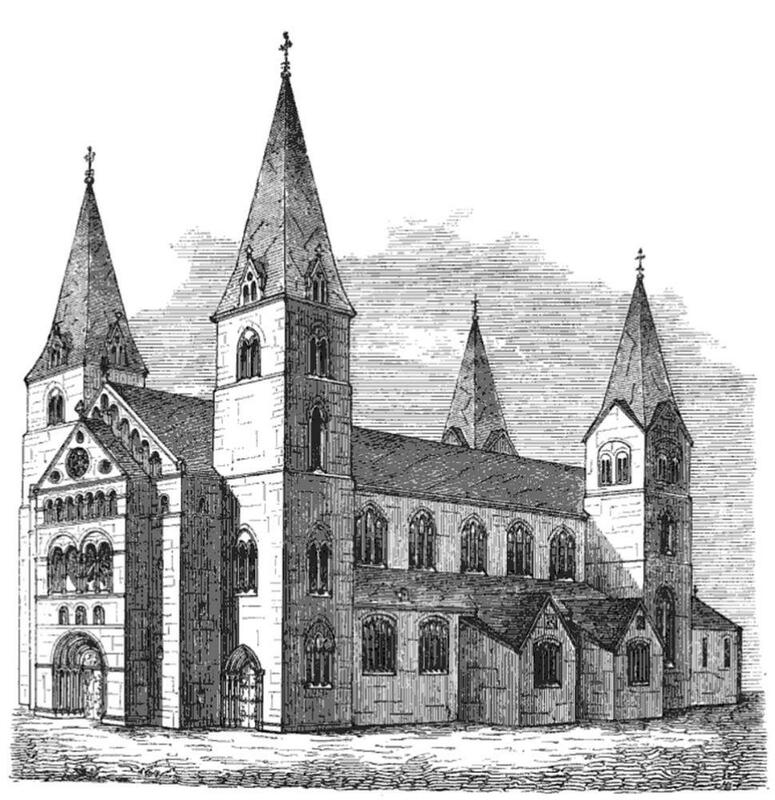 He founded the Abbey of Echternach and in 700 here was built larger church, in Merovingian style. Willibrord stayed here for most of the time and when he died in 739, he was buried in Echternach. Soon after he was declared to be a saint and now he is the patron saint of Luxembourg. In remembrance of miracles associated with him every year in summer, on Whit Tuesday takes place Dancing Procession. This is major event with thousands of tourists and pilgrims coming to Luxembourg, the last such traditional dancing procession in Europe. 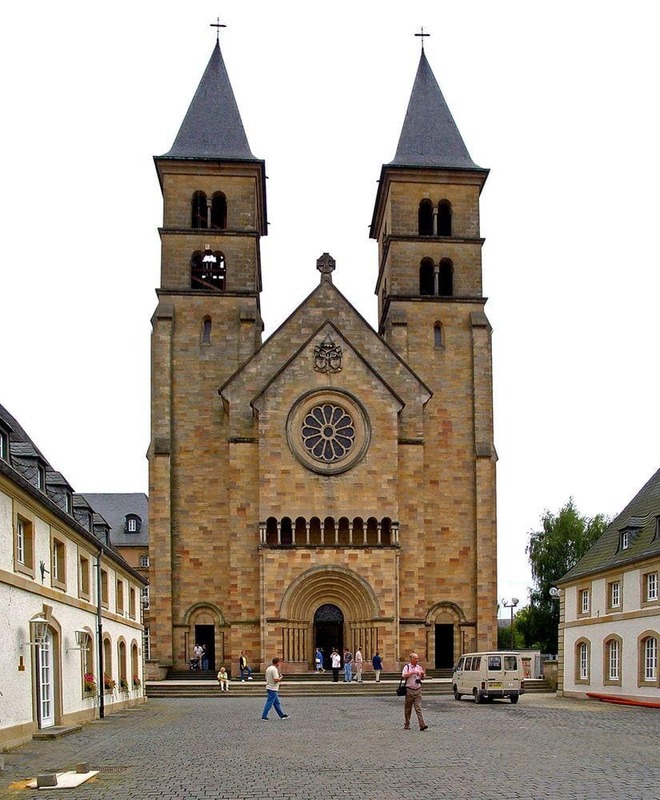 Willibrord brought to Echternach a group of highly educated Irish monks – enlighteners of Frankish people. In 751 the abbey was raised to a status of royal abbey and granted immunity. A prosperous town developed around it. Charlemagne even took direct control over the abbey for a year in 797. Echternach Abbey turned into an important centre of knowledge, with the most important scriptorium – facility of writing and illuminating of manuscripts – in Frankish Empire. Here were made significant inputs in the development of German script and other major advances in culture laying the basis for Carolingian Renaissance. In the 9th century the abbey reached peak influence but with the decline of Carolingian Empire this influence faded and in 847 the Benedictine monks were evicted. They returned in 971 and monastery for some time became an intellectual centre again. 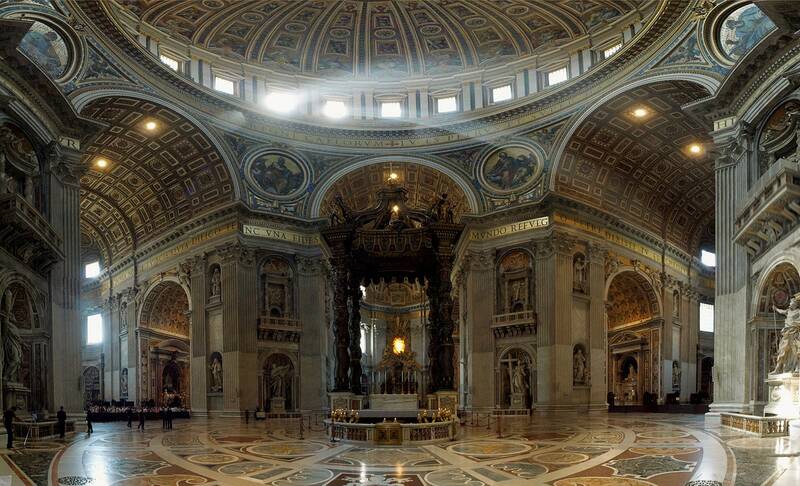 Around 800 there was built a new church again, now in Carolingian style. It was burned down in 1016. 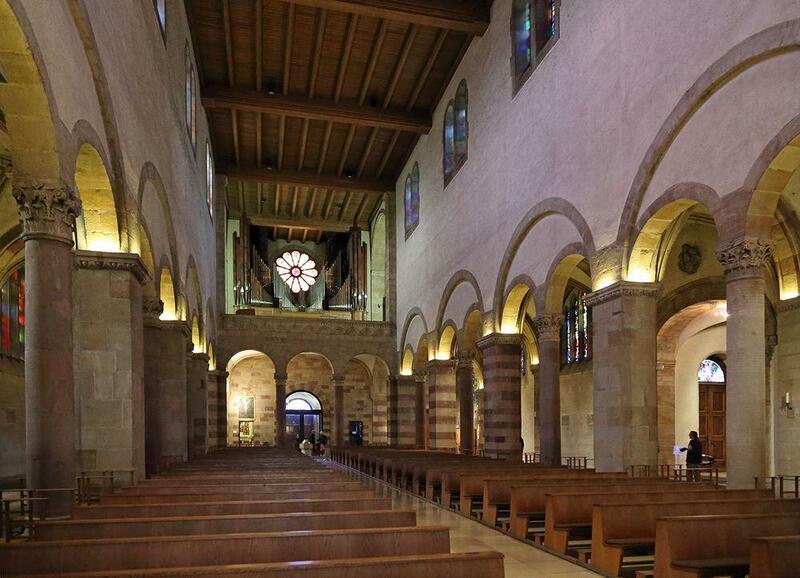 Next church – now in Romanesque style – was built in 1031, with a comparable size to the current church. It existed for long centuries until the French Revolution. Then, in 1793 – 1794 the monastery was abandoned, the burial of Willibrord was desecrated and damaged. The old church stood abandoned and in the middle of the 19th century it partly collapsed. Local people organised a society for the reconstruction of the church and a new one was built in 1868 – in Neo-Romanesque style. 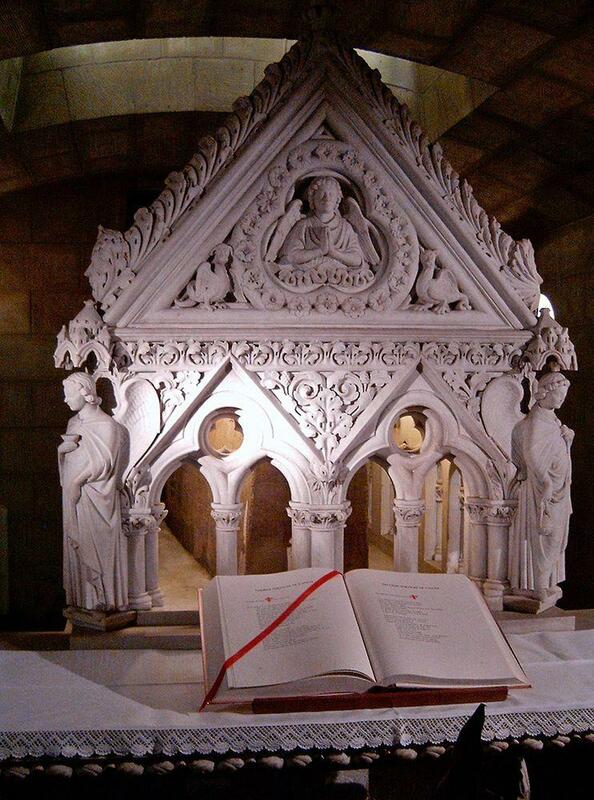 In 1939, 1200 years after the death of St.Willibrord the church attained the status of Basilica minor. Unfortunately soon after, during the World War II is was destroyed. Current church was rebuilt in 1953 – now returning to the Romanesque forms and modelling the facade after Sacré-Cœur in Paray-le-Monial (France). In the crypt of the church is located Willibrord Well – it attracts pilgrims who hope that its water will help to heal skin diseases. 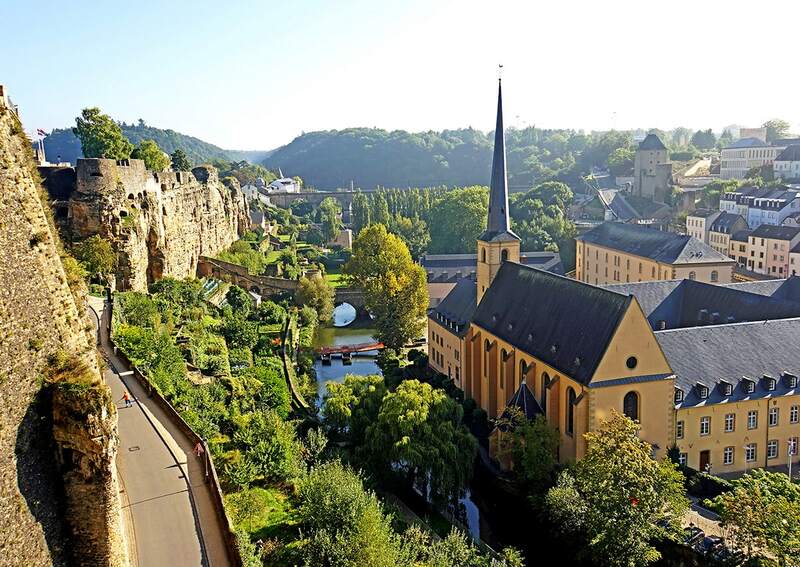 Although Wondermondo’s list of wonders in Luxembourg might seem not too long, don’t be mislead: in spite of its small size Luxembourg is very interesting and charming country. Most impressive and best known landmarks here are Old City of Luxembourg and Vianden Castle, but there is a lot more: huge amount of castles and palaces, Celtic heritage, spectacular cliffs, canyons and caves. Discusses the geography, climate, history, wildlife, economy, government, people, religion, and culture of Luxembourg.